Experience Lake Michigan Charter fishing and other West Michigan fishing hot spots for Salmon, Steelhead and Trout with the expertise of Captain Art Schotts Jr. Captain Art has been charter fishing in the West Michigan waterways for many years and knows the best places to take you and your group to catch trophy size fish and have a great time doing so. 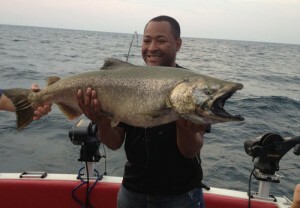 Fish Lake Michigan and Muskegon Lake to Get Hooked on Fishing – MICHIGAN’S BEST KEEP SECRET! Captain Art is passionate about fishing. His goal on every fishing charter trip is to share he love for fishing, his top notch charter boat and great equipment with every person that steps foot on one of his boats. Captain Art is committed to providing the best possible fishing experience on both Lake Michigan and Muskegon Lake to every man, woman or child that is on a fishing charter trip with him. Lake Michigan and Muskegon Lake Sport Fishing – “FISH STIX” is a 30′ Wellcraft Express Cruiser tournament style fishing machine, with twin V-8 engines. “FISH STIX” accommodates up to a group of 6 individuals as well as crew of 3 members. All tackle and equipment are provided with complimentary cleaning and bagging of all fish kept in a professional fish cleaning station by Captain Art. 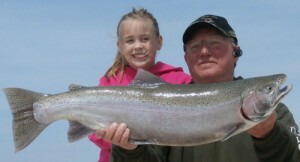 Your pictures may be added to our fishing report and Steelhead Charters Facebook page. We Will Get You Hooked on Fishing Lake Michigan and Muskegon Lake!